There are only a few herbs that make it into my herb garden every year. Parsley is one of them. As far as cooking goes, I probably use just as much parsley as basil which is really saying a lot...cause I have a serious love affair going on with basil! 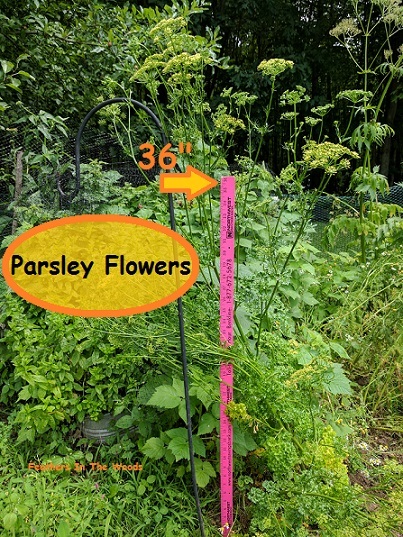 Parsley (Petroselinum crispum) is an easy to grow biennial plant. That means that it grows for 2 years. The first year parsley starts from seed. It dies back a bit but lasts through the winter then starts growing again in spring. In the second year it flowers and the flower stems can reach almost 4 feet tall! In the fall, it goes to seed. It dies off after going to seed. 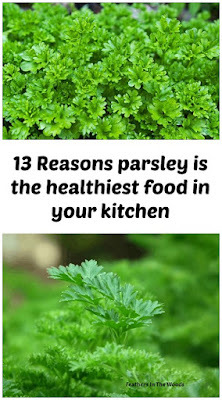 While you can eat parsley from the plant for both years of it's life, it generally tastes much better the first year. Parsley is a spice cupboard staple but can also be found fresh in almost any grocery store produce section. Many stores sell small parsley plants which is great if you're going to be using a lot of it! Parsley grows well in a pot on a sunny windowsill. I prefer the curled leaf parsley though I can't discern a taste difference from the flat leafed variety. My favorite way to use parsley (other then when I'm cooking!) is as a tea. I pour boiling water over about a tablespoon of fresh, crushed parsley leaves. Allow to steep for about 5 minutes. Strain and drink. Parsley tea has a mild 'fresh-green' taste so if you don't favor that flavor you might want to add some honey and lemon. Many people add parsley when they're making fresh juices also. I've never tried that but it sounds quite good! 1) Diuretic. Parsley acts as a diuretic which increases your urine output. This helps to reduce fluid retention and helps to flush out your kidneys. 6) Has anti-bacterial and anti-fungal properties. Fun fact: Parsley was once used as a hangover cure. With the amount of vitamins and minerals that it contains I completely understand how it might help! This is one of the weird things about Parsley...while it may help to prevent kidney stones it can also contribute to them when taken in large doses for an extended amount of time. I guess this is a case of too much of a good thing is just too much! While most of us view parsley as just a garnish, in other countries it is taken far more seriously. In Turkey it's used by diabetics and this study on rats has produced very interesting results on parsley's effects on blood glucose levels! While it is safe to consume Parsley with foods as you normally would, taking it as a supplement should be avoided during pregnancy as per WebMD. 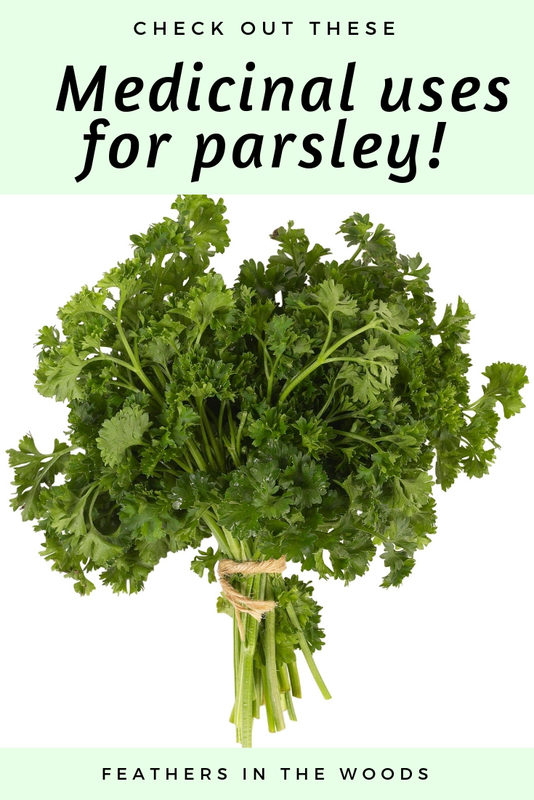 Parsley also reacts with certain medications so check that link in the last sentence for more info! I've been using herbs as tea and in capsules for years now and I've gotten great results with many of them. If you want to take parsley as a capsule check out my post on why I stopped buying herb supplements and what I do instead. You can also buy pre-made parsley tea bags if you want to drink the tea but don't feel like messing with fresh herbs. Ok, I'm getting out of here! Enjoy your parsley tea and if you want to read more about herbs and health check out 7 ways to use Basil as medicine. Wow...that's really neat, the butterflies don't seem to bother my Parsley so I never noticed that! Thank you,I didn't know that it had so many health benefits. I love my parsley too! I just read your post on making calendula oil (2014?) and have a question. I am growing calendula this summer and harvesting the flowers. What part of the flower do I keep after it is dried? What part is put in the oil? Thanks in advance for your help.